Reports that Sony was retiring its 13.3" e-ink writing slate took a turn for the ridiculous today with the news that Sony has a new retail partner. Word is coming in from MobileRead that B&H Photo will soon be carrying the DPT-S1. This camera store has but a single location which is located on the isle of Manhattan, but on the plus side it ships from its website, and yes, it will ship internationally. This device is currently listed as pre-order on the B&H website, with a retail price of $800. There's no info on when it will be available. 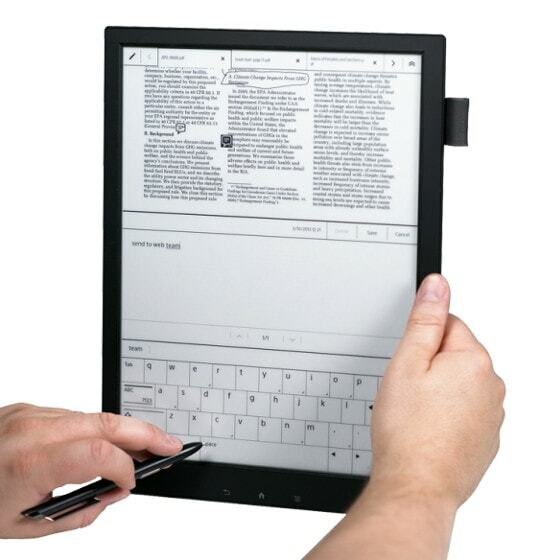 The DPT-S1 is a limited function writing slate based on a 13.3" E-ink screen. It packs in both capacitive and stylus-based touchscreen tech, Wifi, and limited online abilities, but it's rather limited in terms of software features. This writing slate only supports PDFs, making it a true digital writing slate (as opposed to an ereader). The limited format support has continued to frustrate ereader fans ever since the DPT-S1 debuted a couple years ago, but Sony has shown no interest in expanding the writing slate's feature set.